/ Tis the season for a visit to Hersheypark Christmas Candylane! 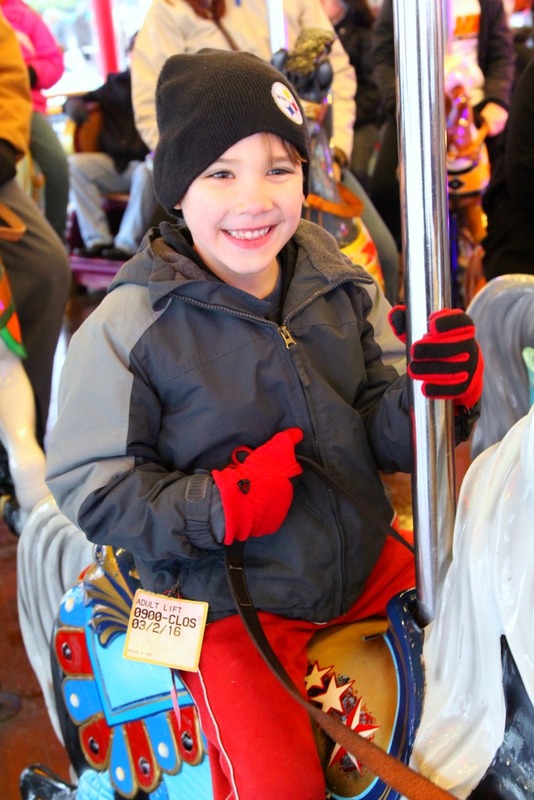 One of our favorite holiday traditions is to visit an amusement park. We just love all the decorations, lights, and shows. 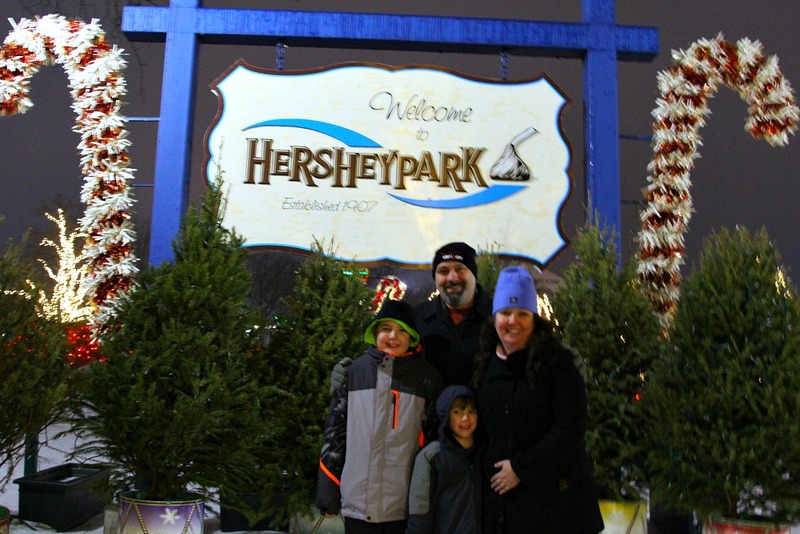 This year, we traveled to PA to experience Hersheypark Christmas Candylane. Never been to an amusement park in winter? Wondering what rides are open? Well, it is always a good idea to check the park’s website to find out which rides are running. We were surprised and excited to learn that several roller coasters would be running at Hersheypark. Enjoy rides on five of our favorite coasters: Cocoa Cruiser, sooperdooperLooper, Wildcat, Wild Mouse, and Laff Trakk which – new this year – is decking its halls with Christmas-themed décor in the spirit of the holiday season! 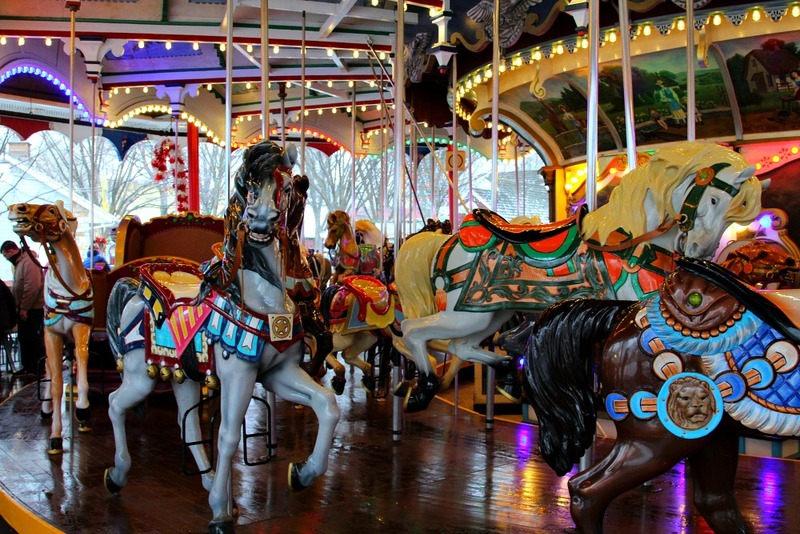 The carousel is always a big hit for the whole family. 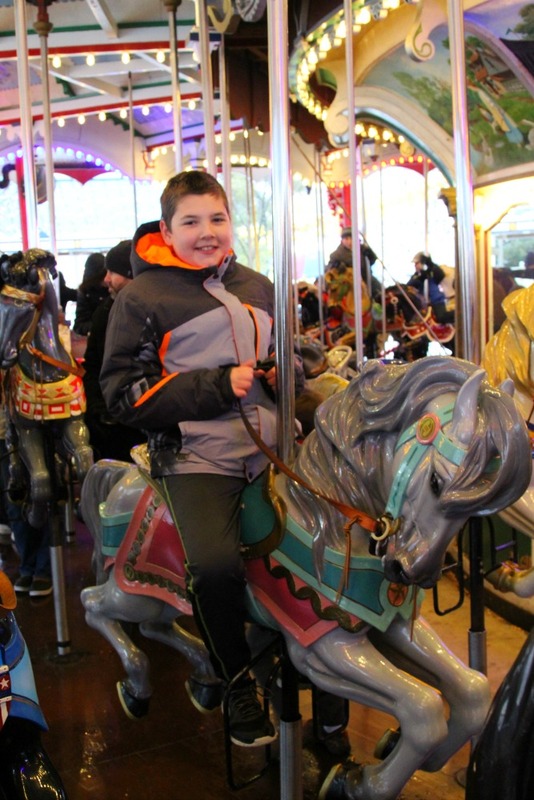 Carousel rides at Hersheypark Christmas Candylane are really festive as the traditional carousel music is replaced with Christmas carols. Tip: sit in front of the kids so you can capture their smiles. Ok, so here is an insider tip. Always hit up a show when you go to an amusement park in winter. It is a perfect opportunity to really warm up. We are always impressed with the performances we have seen at amusement parks and “A Music Box Christmas” was no different. It was full of music and magic! A mysterious music box found in Grandma’s attic brings the magic of Christmas to life in this delightful show that “kids” of all ages will enjoy! This is a must do at Hersheypark Christmas Candylane. The best place to view it is from one of the bridges in the section of the park called The Hollow. Get your toes ready to tap along with the music as the lights along the water dance in front of your eyes. Everyone will be delighted by more than 200,000 dancing lights synchronized to your favorite Christmas Music. Nightly shows start every half hour starting at 5 PM. Select Dates Nov. 11 – Jan. 1 Check the calendar for dates and hours. Make sure you take a look here to see all the seasonal activities at the park including the light show, the musical, and storytimes. Tickets can be purchased online and in my opinion are very reasonable for a full day of family fun. 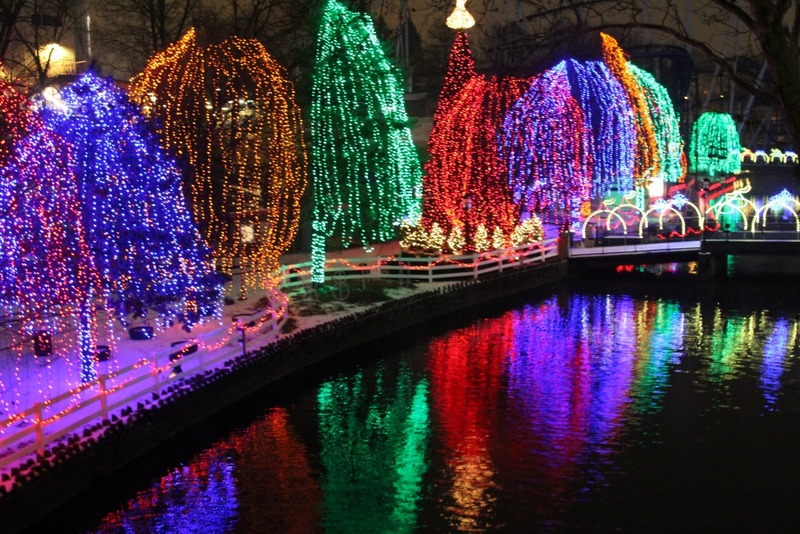 You can also get tickets for Hershey Sweet Lights drive through light display. Dress for the weather: Baby, it’s cold outside all winter long in PA. Don’t forget hats, gloves, scarves, and snow boots if you’ve got them. If you have snow pants, wear those too. It snowed or more accurately iced the morning before we went and some of the rides had wet seats. Take hand warmers: I always buy a case of hand warmers for skiing but we were very happy to have them to use at Hersheypark. Merry Christmas to you! May all your holiday memories be #hersheyparkhappy! 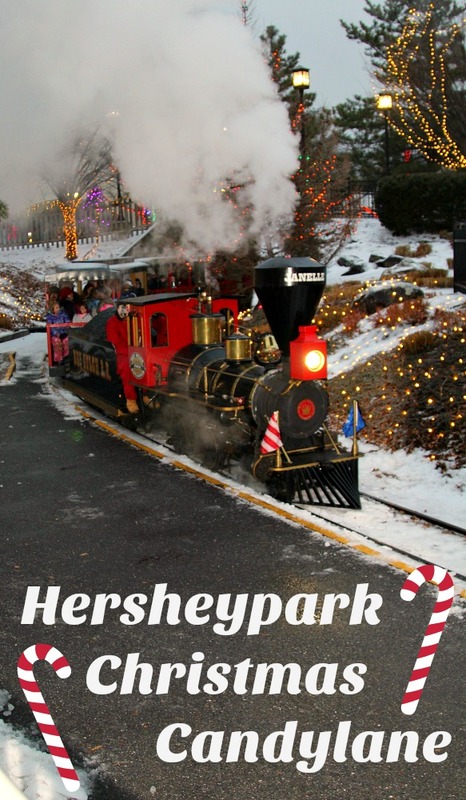 Visiting Lancaster County and Hershey Park is on our family trip bucket list. The kids have talked about going ever since we drove through the area and they saw a brochure in a rest stop. It looks like you all had fun and Christmas may be the perfect time to go!